Sunflower oil is the non-volatile oil pressed from the seeds of sunflower (Helianthus annuus). Sunflower oil is commonly used in food as a frying oil, and in cosmetic formulations as an emollient. The world’s total production of sunflower oil in 2014 was nearly 16 million tonnes, with Ukraine and Russia as the largest producers. Sunflower oil is a mixture mainly of the polyunsaturated fat, linoleic acid (59% of total), and the monounsaturated fat, oleic acid (30% of total). In sunflower oil plant breeding and manufacturing, four types of processed oil containing different amounts of the major fatty acids are produced. 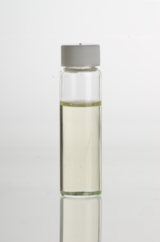 The expressed oil has light amber color with a mild flavor. The oil contains a rich content of vitamin E.
As of 2017, genome analysis and development of hybrid sunflowers to increase oil production are under development to meet greater consumer demand for sunflower oil and its commercial varieties. Four types of sunflower oils with differing concentrations of fatty acids are produced through plant breeding and industrial processing: high-linoleic, high-oleic, mid-oleic, and high-stearic combined with high-oleic. In an analysis of the sunflower genome to reveal plant metabolism producing its oil, phytosterols were identified, as confirmed in another analysis of sunflower oil components, including polyphenols, squalene, and terpenoids. In 2014, world production of sunflower oil was 15.8 million tonnes, led by Ukraine (4.4 million tonnes), Russia (4.1 million tonnes), Argentina (0.9 million tonnes), Bulgaria (0.8 million tones) and Turkey (0.7 million tonnes). Several varieties of sunflower oilseeds have been developed by standard plant breeding methods, mainly to vary the amounts of oleic acid and linoleic acid which, respectively, are the predominant monounsaturated and polyunsaturated fats in sunflower oil. Sunflower oil is a rich source of vitamin E (tables). Sunflower oil is liquid at room temperature. The refined oil is clear and slightly amber-colored with a slightly fatty odour. 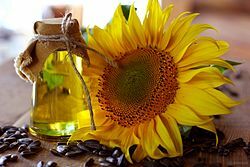 Because sunflower oil is primarily composed of less-stable polyunsaturated and monounsaturated fatty acids, it can be particularly susceptible to degradation by heat, air, and light, which trigger and accelerate oxidation. Keeping sunflower oil at low temperatures during manufacture and storage can help minimize rancidity and nutrient loss—as can storage in bottles that are made of either darkly-colored glass, or, plastic that has been treated with an ultraviolet light protectant. Sunflower oil can be extracted using chemical solvents (e.g., hexane), or expeller pressing (i.e., squeezed directly from sunflower seeds by crushing them). “Cold-pressing” (or expeller pressing) sunflower seeds under low-temperature conditions is a method that does not use chemical solvents to derive sunflower seed oil. Refining sunflower oil through solvent extraction, de-gumming, neutralization, and bleaching can make it more stable and suitable for high-temperature cooking; but, will also remove some of the oil’s nutrients; flavor; color (resulting in a pale-yellow); free fatty acids; phospholipids; polyphenols; and, phytosterols. Unrefined sunflower oil is less heat-stable (and therefore well-suited to dishes that are either raw or cooked at low temperatures); but, will retain more of its original nutrient content, flavor, and color (light-amber). Methods for cooking snack foods, such as potato chips or French fries, may use sunflower oil. Extraction of sunflower oil leaves behind the crushed seeds, typically referred to as seed meal, which is rich in protein and dietary fiber and used as an animal feed, fertilizer or fuel. Taking sunflower oil dietary supplements is not an effective treatment for eczema. Sunflower oil can be used to run diesel engines when mixed with diesel in the tank. Due to the high levels of unsaturated fats, there is higher viscosity in cold temperatures. ^ a b “Sunflower oil production in 2014; Crops processed/Regions/Production quantity (pick list)”. United Nations Food and Agriculture Organisation, Statistics Division (FAOSTAT). 2017. Retrieved 16 February 2017. ^ a b “Four types of sunflower oil”. National Sunflower Association. 2018. Retrieved 19 November 2018. ^ a b Badouin, H; Gouzy, J; Grassa, C. J; Murat, F; Staton, S. E; Cottret, L; Lelandais-Brière, C; Owens, G. L; Carrère, S; Mayjonade, B; Legrand, L; Gill, N; Kane, N. C; Bowers, J. E; Hubner, S; Bellec, A; Bérard, A; Bergès, H; Blanchet, N; Boniface, M. C; Brunel, D; Catrice, O; Chaidir, N; Claudel, C; Donnadieu, C; Faraut, T; Fievet, G; Helmstetter, N; King, M; et al. (2017). “The sunflower genome provides insights into oil metabolism, flowering and Asterid evolution”. Nature. 546 (7656): 148–152. Bibcode:2017Natur.546..148B. doi:10.1038/nature22380. PMID 28538728. ^ Rauf S, Jamil N, Tariq SA, Khan M, Kausar M, Kaya Y (2017). “Progress in modification of sunflower oil to expand its industrial value”. J Sci Food Agric. 97 (7): 1997–2006. doi:10.1002/jsfa.8214. PMID 28093767. ^ Christov M (2012). “Contribution of interspecific hybridization to sunflower breeding” (PDF). Helia. 35 (57): 37–46. doi:10.2298/hel1257037c. ^ Alfred Thomas (2002). “Fats and Fatty Oils”. Ullmann’s Encyclopedia of Industrial Chemistry. Ullmann’s Encyclopedia of Industrial Chemistry. Weinheim: Wiley-VCH. doi:10.1002/14356007.a10_173. ISBN 3527306730. ^ British Pharmacopoeia Commission. “Ph Eur monograph 1371”. British Pharmacopoeia 2005. Norwich, England: The Stationery Office. ISBN 0-11-322682-9. ^ a b “Sunflower oil fatty acid profile” (PDF). National Sunflower Association. 2018. Retrieved 19 November 2018. ^ Alicia Ayerdi Gotor; Larbi Rhazi (2016). “Effects of refining process on sunflower oil minor components: a review”. Oilseeds and Fats, Crops and Lipids. 23 (2): D207. doi:10.1051/ocl/2016007. ^ a b Chu, Michael (2004-06-10). “Smoke Points of Various Fats – Kitchen Notes”. Cooking For Engineers. Retrieved 2013-02-07. ^ Cox, Jeff (April 1979). “The Sunflower Seed Huller and Oil Press”. Organic Gardening. Rodale Press. Retrieved 26 June 2013. ^ Peter Vatrooshkin (2012). Easier Than a Steamed Turnip: Simple and Delicious Meatless Russian Recipes. Plutagora LLC. pp. 21–22, 26–28, 30. ISBN 9781938407017. ^ “How we make Lays Classic potato chips”. Frito-Lay North America, Inc. 2017. Retrieved 16 February 2017. ^ “The best chips you have ever tasted”. BBC Food Recipes. 2017. Retrieved 16 February 2017. ^ Lomascolo, A; Uzan-Boukhris, E; Sigoillot, J. C.; Fine, F (2012). “Rapeseed and sunflower meal: A review on biotechnology status and challenges”. Applied Microbiology and Biotechnology. 95 (5): 1105–14. doi:10.1007/s00253-012-4250-6. PMID 22752367. ^ Bath-Hextall FJ, Jenkinson C, Humphreys R, Williams HC (2012). “Dietary supplements for established atopic eczema”. Cochrane Database Syst Rev (Systematic review). 2 (2): CD005205. doi:10.1002/14651858.CD005205.pub3. PMID 22336810. ^ Johnson, JJ. Meyer, RF. Krall, JM. Shroyer, JP. Schlegel, AJ. Falk, JS and Lee, CD. 2005. Agronomic Practices. In High Plains Sunflower Production Handbook. Kansas State University, Manhattan, KS [accessed 2014 October 22].